Enjoy ocean views on the Interurban Trail. Photo credit: Amy Page. It’s officially autumn, and the colors are already changing. As nature transitions from bright summer green to orange and red fall hues, you may want to check these changes out for yourself – and what better way to do it than a crisp hike through nature? Here’s a list of hikes we recommend for fall just outside your door. We picked out parks and trails in and around Bellingham, and we’ll even let you know which hikes your dog can tag along on. Check it out! 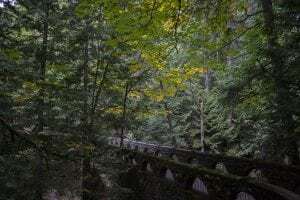 The mossy bridge at Whatcom Falls Park is made of Chuckanut sandstone. Photo credit: Amy Page. Whatcom Falls Park has several trails perfect for watching the colors change. Surrounded by trees, it’s easy to look up and enjoy the show. Some paths wind along multiple places, including thick forest, open spaces and the creek. Follow Whatcom Creek as the water moves from waterfall to waterfall. The constant, peaceful rush is a calming sound. You can check out the main part of the falls from the mossy stone bridge near the parking lot. There’s a swimming hole further down the trail too and, though I wouldn’t personally recommend going for a swim in the middle of October, it’s still a pretty sight. Whatcom Falls is also part of the Washington State Birding Trail, and it’s easy to figure out why. Just stepping out from the parking lot, you can hear chips and squawks from multiple species. Other points include a playground for kids, the hatchery, a seasonal fishing pond for youth 14 and under, and more. The Interurban Trail runs from Larrabee State Park to Fairhaven and can be long or short depending on what you want to do, according to the Whatcom Trails Association. 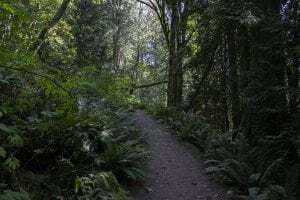 The result of former railroads that ran through the trailheads until 1928, the Interurban trail is a fantastic hike for those who want to take in incredible views of Bellingham Bay and the San Juan Islands. Tree branches hang over many parts of the trail, and it’s not uncommon for fallen leaves to litter the ground, making for a cool Autumn hike from Larrabee to Fairhaven. Parts of the hike branch off into other trails, including a path to Fragrance Lake. Depending on where you embark or disembark, you can pass small waterfalls, feel the crunch of leaves under your feet and more. Sehome Hill Arboretum’s tunnel was hand-dug. Photo credit: Amy Page. Sehome Hill Arboretum is right next to Western Washington University, and it’s not uncommon to see students and professors alike on morning jogs, casual walks or even taking classes. Considered a “backyard playground” for WWU, the arboretum is a thickly forested park on Sehome Hill with sights that will definitely remind you fall is here. The arboretum also has an overlook tower, great for looking out over Bellingham Bay. You’ll sometimes run into joggers climbing the tower. 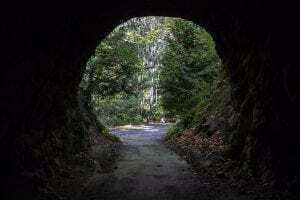 Be sure to check out the tunnel too, which was hand-carved out of rock in 1923. Outdoor Science Learning Resources, a geology class offered by WWU, helps maintain and improve the arboretum. Chanterelle Trail is a tall climb with amazing views of Lake Whatcom at the top. Photo credit: Amy Page. Chanterelle Trail is a fantastic hike to take along Lake Whatcom. 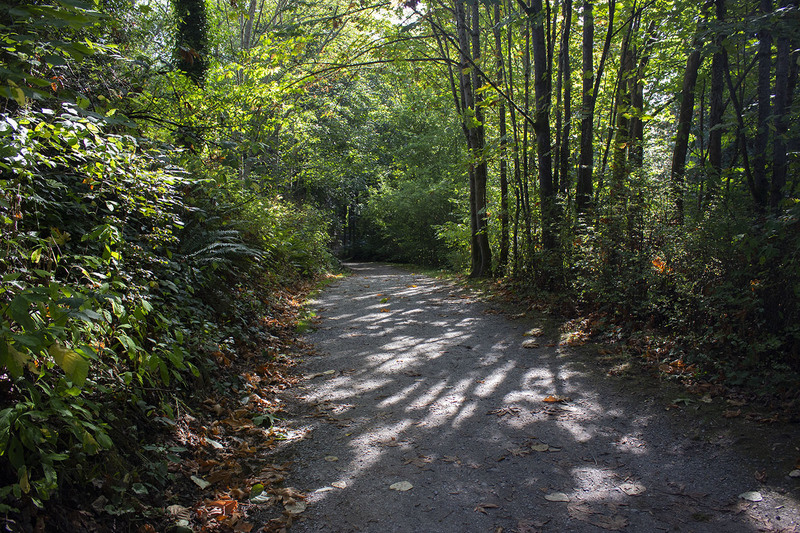 Lake Whatcom Park offers a large, winding network of trails, including Hertz Trail. Chanterelle Trail in particular, however, offers gorgeous views of Lake Whatcom. The trail itself is a 2.4-mile uphill climb with an elevation gain of 100 feet, featuring long switchbacks. It can be a strenuous hike despite its short mileage (switchbacks and I don’t get along, and I’ve hiked Oyster Dome), but the view at the top is definitely worth it. Along the way, appreciate the forestry of the park. You might catch a squirrel rustling through the foliage, or a woodpecker in the trees above. Though this hike is great now, the Whatcom Trails Association also recommends visiting in the winter after enough leaves fall, opening views along the way.